It’s time to come clean with all my projects! In a perfect life, I would have 2 projects going at once, maybe 3. 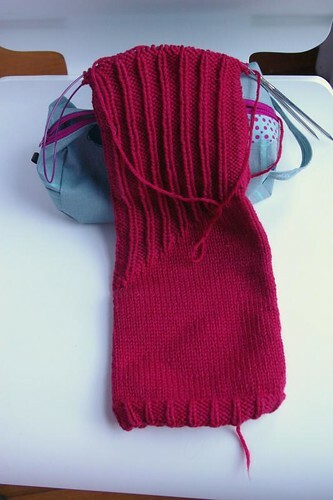 Long term project: Ursa cardigan, set aside for the summer but I’ve started working on the sleeve again. 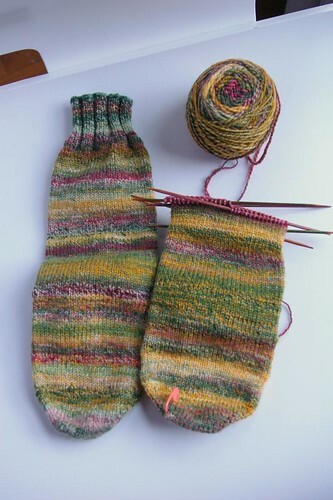 Of course I also have the Tessarae sock you saw last week and many more projects on the mind! I hear that purple is the “In” color for this winter and that’s what I’ve got! 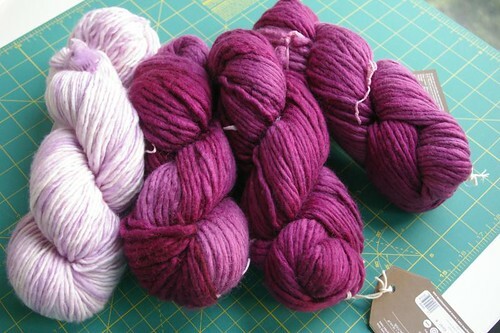 The 3 skeins of bulky weight (Araucania Coliumo Solid) will be for Carol’s Kensington Cowl and the 1 skein of worsted weight (Madtosh Tosh Merino) will be for another cowl, the Tamarind Cowl. I also bought the Little Colonnade shawl pattern and I think that might be my next shawl. I also quite like the Wandering the Moor shawl pattern, so that’s going to be a tough fight deciding which to go with! But first I have to finish Lu! How many WIPs do you have? I have thousands of WIPs. It doesn’t bother me. Maybe I’m a process knitter? 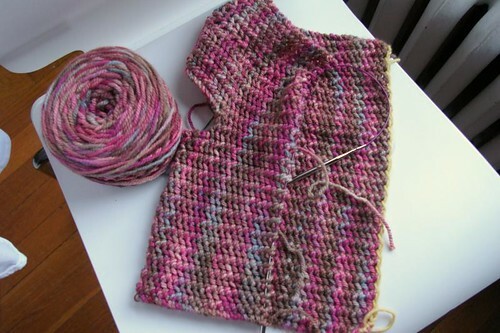 And finally, the one I always avoid: The Big Sack Sweater – adding length, need to take the cable down and fix errors. Is that Noro on those plain stockinettes? I really love that Araucania!